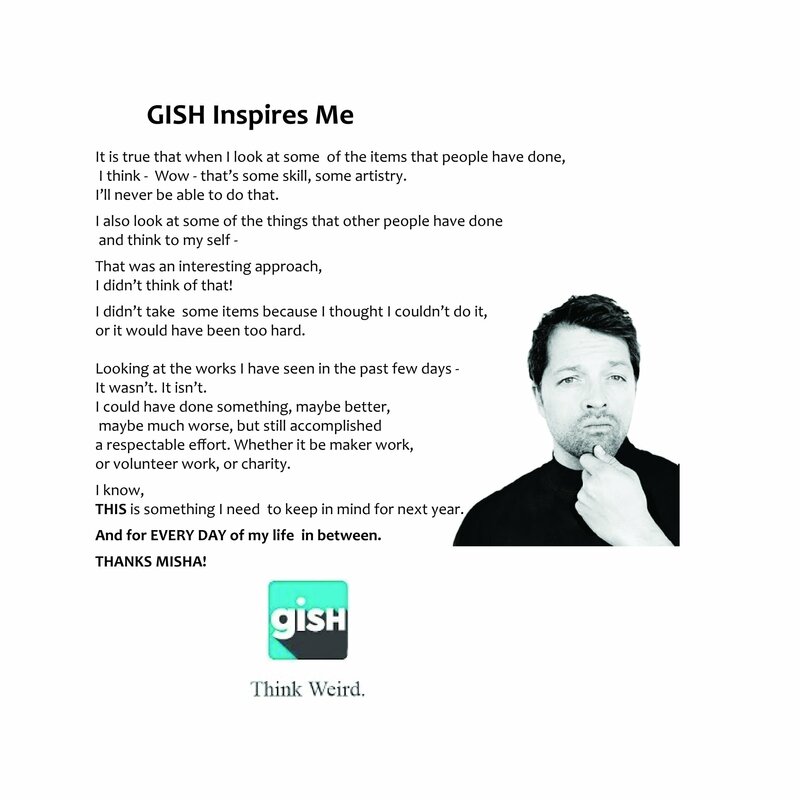 For years, Misha Collins, who plays Castiel on Supernatural, has run the Greatest International Scavenger Hunt the World Has Ever Seen, or GISHWHES for short. Last year was the last GISHWHES, and many people were sad, but wondering what Collins would do this year. This year, he debuted GISH. It’s pretty much the same thing: a scavenger hunt of two hundred or more items where you have to do something silly. Or crazy. Or creative. Or charitable. Or absurd. Or all of the above. Or some of the above. Wrenn and I were once again involved, joining our crazed buddies in a team we have been calling Inevitable Innuendo. While some people are in it to win it, we’re just in it to have fun and do silly things. We’re never going to win the hunt, but that’s not really the point. We had a blast. Re-create a moment from a beloved cartoon series. I figured Hong Kong Phooey was perfect for this, so I got into my karate uniform and took a picture to match a freeze-frame from the opening credits of Hong Kong Phooey. This year, there was a GISH app, which aided us in the hunt. 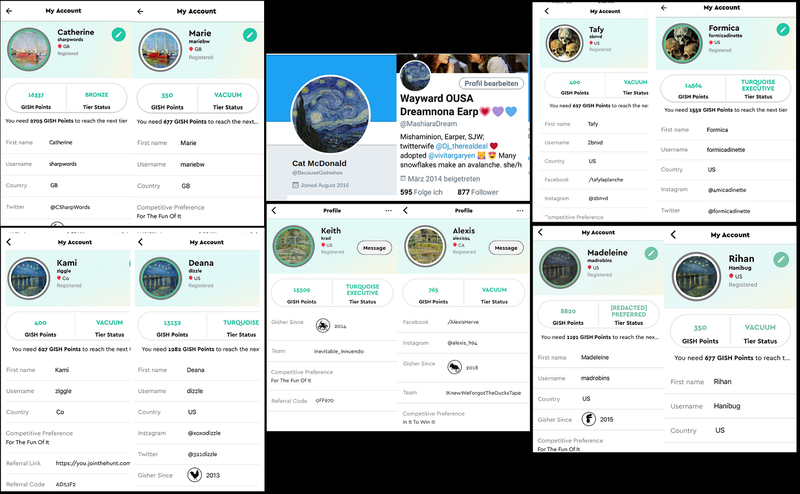 You got to choose an avatar as part of the hunt, and on Tuesday we were told to pick a favorite Impressionist painting as our avatar and then find someone not on your team who had the same painting. I figured everyone would go for Starry Night (thank you, Doctor Who), and besides, my favorite Impressionist painting is Monet’s Bridge Over a Pond of Water Lillies. I had no trouble finding someone else (a nice person named Alexis) who matched. At least six folks on the team had to find a match, and we did it……. One item was simply: beard garden. So Wrenn put this together on my beard. I lost a lot of little tiny hairs on this one………………………………..
Karaoke is always fun, and karaoke in a library is even more fun! But libraries are quiet, peaceful places, so our library karaoke had to be silent. We figured everyone was gonna do, “Carry on, Wayward Son” by Kansas, so we went for another song Supernatural used, “Renegade” by Styx, used to great effect at the end of one of my favorite episodes of the show, “Skinwalker” (the episode that introduced FBI Special Agent Victor Henriksen, one of my favorite recurring characters). This one was all Wrenn: Putin on a Ritz. I think it speaks for itself…..
One of the team items was to do a group photo where we’re all in a mailbox. My sister from another mister, Laura Anne Gilman assembled all our various photos and put us in mailboxes. (I deliberately used the selfie I took of the expression on my face while suffering through watching Ghost Rider: Spirit of Vengeance. One Wrenn and I did together was this challenge to create a page from a book about Winnie the Pooh’s mobster cousin Vinnie da Pooh. 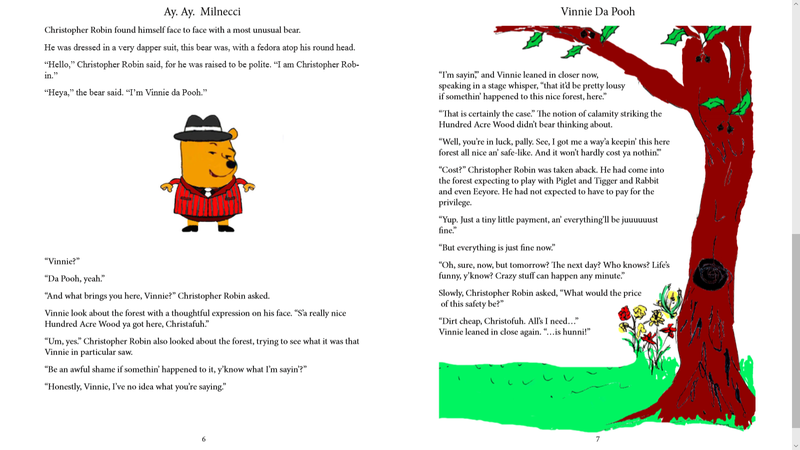 So I did the text and Wrenn did the illustrations and layout for Vinnie da Pooh by Ay! Ay! Milnecci. This one didn’t work out the way we wanted to because the weather didn’t cooperate. We had way too much rain and clouds the week of GISH, so we couldn’t get a good sunset. (Doesn’t help that we’re on the east coast.) But the challenge was to tuck in the sun and read Goodnight, Moon to it. Goodnight, Moon is one of my favorite picture books, and I really really wanted to do that one! 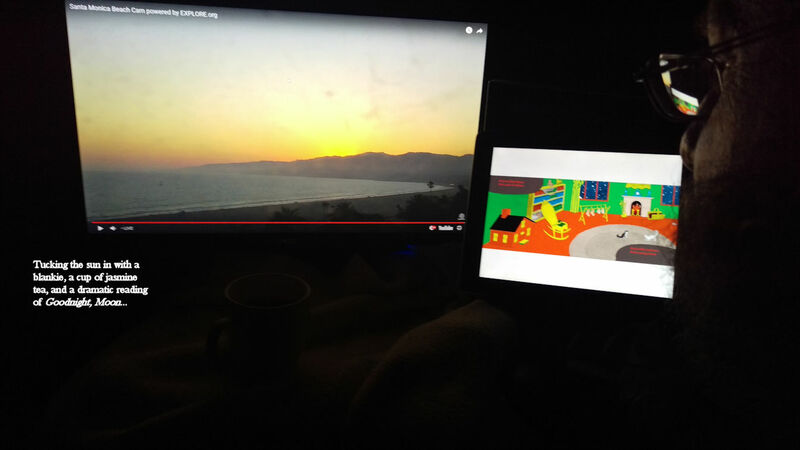 It was Wrenn who came up with the idea of finding a web cam (in this case from Santa Monica) of the sun setting, and I had a blankie and a mug of jasmine tea to tuck in the sun with (it’s dark, but it’s there), while I read a copy of Goodnight, Moon off my iPad. Another challenge was to endorse Collins for an award, but to do so out of pity rather than merit. 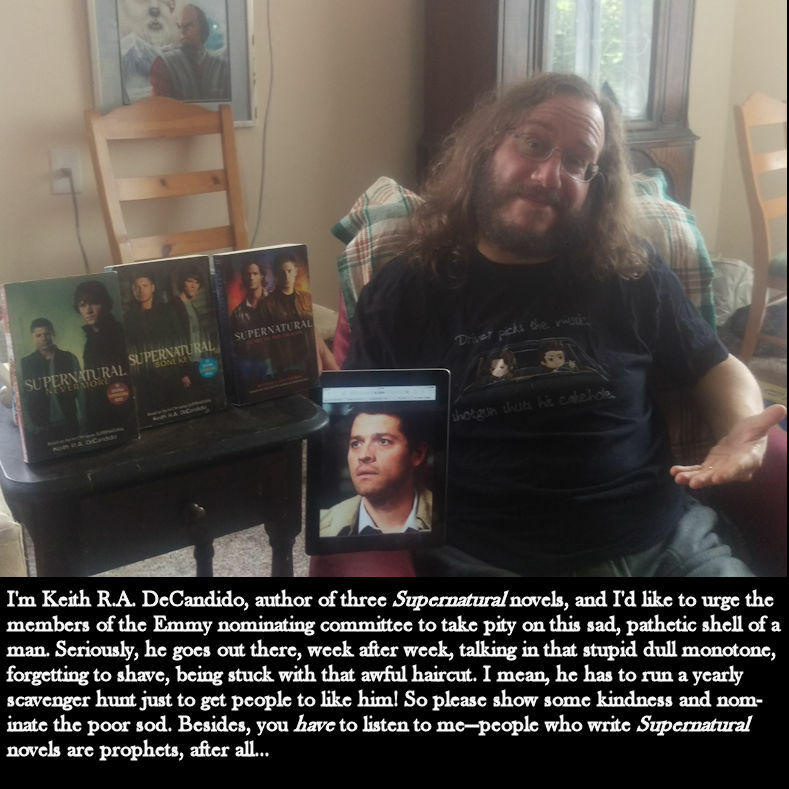 I figured I’d take advantage of my being an author of Supernatural fiction to make it more entertaining……. We were challenged to create a painting of Castiel with a dinosaur, which Wrenn did via her mad image-wrangling skillz. And finally, we were challenged to each pick a skill we’d always meant to learn but hadn’t gotten around to and take at least one step toward learning it. I always wanted to play the harmonica, so I bought and started reading a book on how to play harmonica, and Wrenn always wanted to try her hand at quilting, so she took some Doctor Who scraps and started a Whovian quilt. And there you have it! The rest of our team did lots of other nifty things, from literal superheroes to unicorn hats to tattoos and more besides. Our team is insane, GISH is insane, and I love ’em all. That was fun. However, for a person related to as many librarians as you are, to say libraries are quiet, peaceful places makes me wonder about your memory and experiences. Also, I couldn’t read Vinnie da Pooh – too small. Or maybe it’s better that I don’t? If you click on the pictures with text, it’ll open it full-screen in another tab.